I’m offering a free course, Choosing is the Ticket Price to Your Creative Life, starting September 10th – did you sign up yet? You have to sign up here to be part of the challenge. In anticipation of our time together, I thought it would be useful to examine the myths that might be making it hard to choose what you want to create next. Let’s take on these myths one by one, shall we? Onward, mythbuster! MYTH #1 – There is ONE thing you’re supposed to do with your life, and if you aren’t doing it, you’re off purpose and need to examine your whole life and figure out your LIFE purpose before you do one more thing. The idea that it is superior to do one thing with your life was popularized in the 1960’s during the space race between the U.S. and Russia. Governments wanted more scientists. This one thing for all of your life is a cultural construct! Of course, there was a very different cultural construct during the Renaissance. Then you were lauded if you did a number of things well. Think Eleanor of Aquitaine. And then the idea came along that we have to have an overriding life passion and purpose. Damn if that didn’t get a lot of us all twisted up in knots. Me for one! Did you know new research by Carol Dweck and Greg Walton at Stanford discovered that passions aren’t ‘found’, they’re developed? But to develop them, you have to try things… which means choosing! Of course, some people know from a very young age what they want to do with their lives, and they do spend their lives mastering that thing. But many more people don’t. We dip our toe in. We do something for awhile and then move on. We experiment. Our purpose shows up by exploring what beckons to us and trying things out, and our purpose and passion changes as we grow. Which is so logical, right? The idea that there is a fixed purpose or passion in life, or that we have to master one thing is a hurtful myth that only serves to make some of us feel wrong and bad. Out that myth goes! Bye-bye. MYTH #2 – If you choose wrong, you’ve wasted your life. Susan doesn’t think “I wasted years on real estate because it wasn’t my thing.” Instead, she uses the skills she learned – marketing, taking good care of clients, finding wonderful properties – in her second career. Your life works the same way! Unless you’re suddenly beset by amnesia, whatever you do, you learn and grow from. You can’t choose wrong in life because you’re always gathering skills and personal insights. You know I’m talking truth. Yes, we might stick around someplace too long – for sure! – but that’s because we need to bust these sorts of myths and get supported to choose what’s next. The myth we can choose wrong is bogus and can stop us from seeing that what we really need to do is choose something new! MYTH #3 – You have to produce a MAJOR piece of IMPORTANT work every time you choose. It has to be ground-breaking, innovative, and it must really, really matter. This is exactly the kind of pressure I put on myself about my memoir. No wonder it was so terrible. How does work you’re proud of come about? Through iteration. You learn, you make, you assess, you get trusted feedback, you think about what you wanted the work to do for you, and then you do it again. Look at the work of your favorite scientist, artist, designer, writer, or business person. Did their most important work spring fully formed out of their head one fine day? Is there any indication they knew – or cared! – that a particular project would be “IT”? Major, important, best-selling, brand defining, etc. are all future judgements that distract you from creating and iterating. What matters is the learning and evolving that you do as a human over the course of your life, not any one result or impact. This kind of pressure is a myth that keeps you defended and not creating. MYTH #4 – If you choose something now, it must be your choice forevermore amen. Cue Edgar Allen Poe’s ravens. Nothing is fixed. Not our minds, not our personalities, not our addresses and certainly not our projects and interests. And choosing decides nothing about you. Does this mean that because I have multiple interests that I get a pass to be reckless with them, that I squander them? If I did, I sure wouldn’t be where I am now. I choose to look at my life as a series of projects, and each one has its own purpose. When I pick a project, I devote my whole self to it. And I give it everything I’ve got in that moment. No project or book or business is my forever or yours. Forget the myth of forevermore and let’s let the ravens off the hook, too. They’re such cool birds! MYTH #5- You need more info to make a decision. You need to research. Take a class. Challenge this myth for yourself: do not ask anybody ANYBODY for the next 7 days what you should do about anything. Instead, each time you find yourself seeking outside information, ask yourself, “What do I already know?” Make notes. I’ll bet you a solid gold toilet (Austin Powers movie reference) that you know everything you need to know already to make an informed enough decision. Another myth down for the count. Float like a butterfly, sting like a bee! 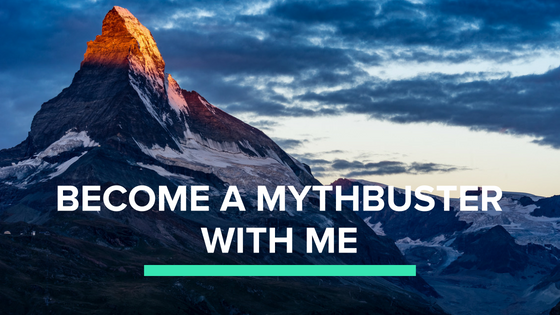 MYTH #6 – You have to choose the practical project, not the one you really want. We’re very good at mistaking opinions and stories for facts. Check your stories about practical vs. what you really want. How do you know you must do something? As in, if you were in front of a judge and had to give just the facts about the “right” choice, what would you offer as proof? My belief is that you’ve got plenty of time to devote to the practical and giving yourself a little bit of time to just do what you REALLY want will pay off in ways you can’t even predict. MYTH #7 – If it doesn’t work out, you are less than. Imagine looking into a baby’s face and telling her, “If you don’t do great things in this life, you are worth less. You should not be loved as much, nor have as much fun, never laugh really hard, or truly savor your life.” You recoiled from this horrible scenario, right? Because you instinctively know that each human is worthwhile just because, and when we are with a baby, we experience this innate goodness that resides at the core of each of us. We giggle and smile and we simply love that baby. This core is still very much who you are and nothing you do – or don’t do – ever changes this innate goodness. Your beingness and worth are never on the line. Choosing a project or a path has absolutely nothing to do with your worth and dignity EVER. I say we’re done and dusted with this one. And there we are. Seven myths gone gone gone. Did I miss one? Please share this post on social media and add your myth and tag me (I’m on Facebook, Twitter and Instagram). I love to learn from you!